kt literary » Blog Archive » SOLD!!! Congratulations to Karen Fortunati! SOLD!!! Congratulations to Karen Fortunati! Please help us celebrate with Karen Fortunati on her sale of two more contemporary young adult novels to the Delacorte imprint of Penguin Random House!! 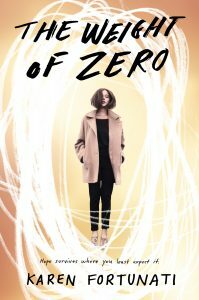 Karen’s brilliant debut, THE WEIGHT OF ZERO, released just this month to glowing reviews. It was named one of Apple’s Best Books of October and was included in the prestigious ABA Indies Introduce list. We’re so thrilled that readers will get to enjoy more wonderful books by this talented author! Author of THE WEIGHT OF ZERO Karen Fortunati’s THE ARC OF A BULLET, about a young woman at the intersection of her brother’s violent mental health breakdown and a police shooting, again to Kate Sullivan at Delacorte, in a two-book deal, by Sara Megibow of kt literary (World English).